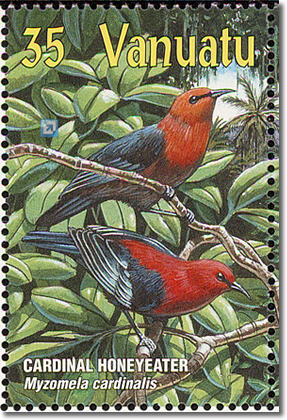 The Cardinal Myzomela (Myzomela cardinalis) is a small, active Honeyeater that is found in American Samoa, Samoa, Solomon Islands and Vanuatu, where it inhabits subtropical or tropical moist lowland and mangrove forests. It measures about 13 cm (5.1 in) from bill to tail. Its long, curved bill is especially adapted for reaching into flowers for nectar.. The male's plumage is red and black. Females are greyish-olive, sometimes with a red cap or red head.